Today promises to be the highlight of the whole trip. Rocio and Felix arrive at 5:50AM to transfer us to the Poroy train station, a few kilometers outside the city. Cusco has a train station dedicated to Machu Picchu, but the residents in the area had it closed down because of noise problems from the train running up a series of switchbacks to climb out of Cusco. I can sympathize with their concerns. Of course the city now fills up with all the tourist buses and taxis heading to Poroy station, but at least they are quieter than the train, although they cause much more pollution. The PeruRail Vistadome train leaves Poroy station at 6:40AM, traveling through the agricultural valley of the Rio Cachimayo through several small towns. Once it passes through the town of Huarocondo, it starts to descend down the steep valley carved by the Rio Huarocondo. We are served a very nice continental breakfast snack, including good Peruvian coffee or soft drinks. 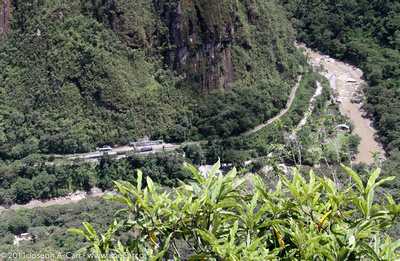 At the half way mark down this valley, the train carefully negotiates a switchback built on the steep sides of the valley before traveling down to the junction of the Rio Huarocondo and the Rio Urubamba. We are now in the Sacred Valley of the Incas, and the train soon arrives at Ollantaytambo station, where it makes its only stop for five minutes. We arrive at Aguas Calientes on time at 10AM. This small community is jammed in a narrow valley where the only road is to Machu Picchu. 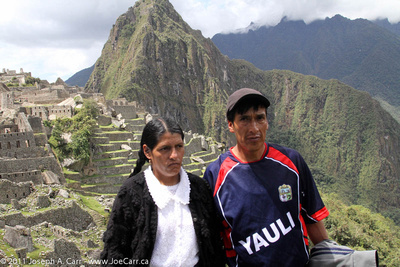 Our guide Grimaldo meets us in the train station, and we then take a transfer bus to Machu Picchu. The bus climbs to the top of the hill on a gravel road with many switchbacks, some 800 metres above the valley below. We soon catch our first glimpses of Machu Picchu – it’s hard to describe using words or photos. It is a wonderful feat of engineering if you consider it has survived virtually intact for centuries through countless tropical rainstorms; hot sun, fierce winds, and yes…the onslaught of tourists. We spend two hours walking the site, learning all the fascinating concepts, which Grimaldo so skilfully conveys to us. I would not want to see Machu Picchu without a guide, at least for a first visit. I can see where it would be wonderful to just go up there to sit and soak up the ambience of this sacred place on my next visit, which would require staying in a hotel in Aguas Calientes for several nights. We see the Temple of the Sun and the Room of the Three Windows in the Sacred District. We also see a sundial, which still has perfect alignment with the cardinal directions. There is a single hotel right at the entrance to Machu Picchu, where we had a nice buffet lunch after our walking tour of the site. I expect the rates to stay there would be very high. There are several hotel and hostels in Aguas Calientes, which no doubt offer less expensive options. We take the bus to the bottom then board the Vistadome train from Aguas Calientes back to Poroy Station near Cusco. As the train makes its way back, the crew put on a fashion show and dragon dance. Of course they then come down the isle and sell the alpaca clothing they modeled. Our trusty driver Felix and tour coordinator Rocio are waiting to transfer us back to Cusco and the hotel. By then it is 8PM, so we decide to skip dinner and go to bed since it was such a full day. This entry was posted in Peru and tagged archaeology, city, engineering, food, mountains, rail, railway, train, valley. Bookmark the permalink.